Area of the seafloor where gases and fluids are released without incurring a significant temperature rise in the surrounding environment. Cold seep ecosystems are found where sulphur and methane emerge from seaﬂoor sediments without an appreciable temperature rise 1. Also known as cold vents, seeps form by a variety of processes related to over-pressuring (e.g. of sediments, or from mineral dehydration reactions and gas hydrate dynamics) 2. These environments, and the communities associated with them, are among the most recently discovered marine habitats: the ﬁrst system was found in 1983 on the Florida escarpment in the Gulf of Mexico 3. Since the first discovery in 1983, active seeps have been reported from all oceans of the world, the highest number occurring within active subduction zones in the Paciﬁc Ocean, along the margins of Alaska, Oregon, California, Central America, Peru, Japan and New Zealand 1. Seeps occur most frequently near ocean margins, from intertidal to hadal (6,000+ m) depths. Due to the financial and technological challenges of carrying out research in deep-sea regions, our knowledge of the systems and the species found there has remained relatively poor. For instance, of the 500 putative species described from hydrothermal vent and cold seep environments, not a single one has had its complete life cycle described 4. The habitat created by seeps is linked to the chemicals (e.g. sulphide) they release. These chemicals support a number of chemosynthetic species. Chemosynthesis is the equivalent to photosynthesis, but organisms produce energy from chemicals (e.g. sulphur) instead of sunlight. Chemosynthetic species range from single-celled organisms (e.g. bacteria) that live in the surrounding sediment and utilise the methane produced 5, to communities of large invertebrate taxa including clams, mussels or worms. Populations of these larger more complex invertebrates are sustained thanks to symbiotic bacteria that carry out chemosynthesis 1. Despite the relatively high biomass found within cold seep areas, species diversity is frequently low 1, 6, 7. This is the result of relatively few species having evolved the physiological and morphological adaptations required to survive in such a challenging environment 8. Consequently, a large proportion of species found in cold seep ecosystems are endemic to them 9, with a large number of species found at present at only one geographical site 10. These unique systems have also helped fuel new theories on the origin of life 11. Organisms which are found in extreme environments are often of commercial interest because of their unique adaptations. In the marine environment, bioprospecting is looking to the deep sea’s extreme environments, including cold seeps, for novel organisms with pharmaceutical potential 12. Cold seep ecosystems are new to science and hence have had limited scrutiny because of the difficulty and expense in getting to them. Of the potential threats to these habitats, mining is considered to be one which could cause considerable damage. Seafloor Massive Sulphide (SMS) deposits are of great interest because they potentially contain significant quantities of commercially valuable metals such as gold 13. At this stage, there are very few businesses involved in this domain, and the activity is at very early stage exploration. Types of threats include direct damage to the seafloor and seep structure, which could potentially lead to the extinction of species, and production of sediment plumes, which could smother filter feeding organisms. Other impacts such as noise and alteration of the fluid dynamics are a concern. The oil and gas industry could also potentially impact this habitat: indeed, this industry is likely to be active in these areas because seep communities can coincide with hydrocarbon reservoirs and gas hydrates 13. An industry which has been found to already be causing damage is the fishing industry. Evidence of impact from deep water trawling has been recorded at a number of cold seep sites around the globe. In Chile, the commercially exploited (and at risk) Patagonian toothfish (Dissostichus eleginoides) is associated with cold seep sites 13. Because these chemosynthetic communities are so recently discovered and relatively unstudied, there is a risk that deep sea fishing activities could impact on species and habitats before they are known to science 14. There has been no international assessment of the risk that cold seep habitats are under. The considerable lack of knowledge makes it almost impossible to quantify the risks. Tunnicliffe, V., Juniper, S. & Sibuet, M. in Ecosyst. Deep Ocean. (ed. Tyler, P.) 582 pp. (Elsevier, 2003). Paull, C. K. et al. 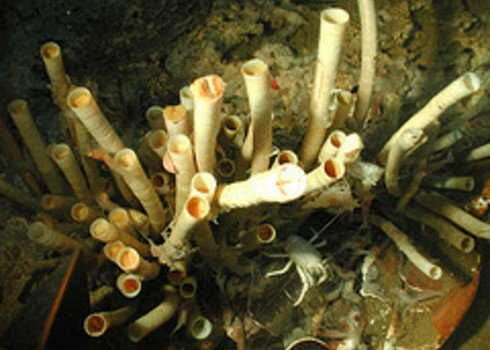 Biological communities at the Florida escarpment resemble hydrothermal vent taxa. Science. 226, 965–7 (1984). Tyler, P. & Young, C. Reproduction and dispersal at vents and cold seeps. J. Mar. Biol. Assoc. UK 79, 193 – 208 (1999). Orphan, V. J., House, C. H., Hinrichs, K.-U., McKeegan, K. D. & DeLong, E. F. Multiple archaeal groups mediate methane oxidation in anoxic cold seep sediments. Proc. Natl. Acad. Sci. U. S. A. 99, 7663–8 (2002). Seitzinger, S. P. et al. Global river nutrient export: A scenario analysis of past and future trends. Global Biogeochem. Cycles 24 (2010). Vanreusel, A., De Groote, A., Gollner, S. & Bright, M. Ecology and biogeography of free-living nematodes associated with chemosynthetic environments in the deep sea: a review. PLoS One 5, e12449 (2010). Hourdez, S. & Lallier, F. H. Adaptations to hypoxia in hydrothermal-vent and cold-seep invertebrates. Rev. Environ. Sci. Bio/Technology 6, 143–159 (2006). Bergquist, D. C. et al. Community structure of vestimentiferan-generated habitat islands from Gulf of Mexico cold seeps. J. Exp. Mar. Bio. Ecol. 289, 197–222 (2003). Synnes, M. Bioprospecting of organisms from the deep sea: scientific and environmental aspects. Clean Technol. Environ. Policy 9, 53–59 (2006). Baco, A., Rowden, A. & Levin, L. Initial characterization of cold seep faunal communities on the New Zealand Hikurangi margin. Marine Geology (272), Issues 1–4, 251–259 (2010).